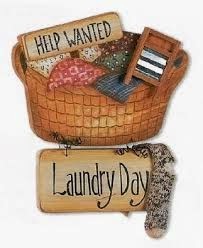 Far Above Rubies: Domestically Divine Tuesday Link-Up ....and a helpful hint for staying on top of the laundry! Domestically Divine Tuesday Link-Up ....and a helpful hint for staying on top of the laundry! What is the one task around your home that seems to never get truly done? At my house, it is laundry! It seems by the time I get a load washed, dried, folded, and put away, the hamper is already overflowing with more to be done! Purge, purge, purge! Consider how many and what items you need to keep, and let go of the rest. Create a schedule! Such a simple thing as a laundry schedule can keep that mountain under control! There are two books that have helped me in this area in a big way! One is an oldie, and one is newer! Disciplines of the Beautiful Woman - Anne Ortlund - Written about all areas of a woman's life in which to be disciplined, including wardrobe! Large Family Logistics - Kim Brenneman - LOVE this book! It is modern, fresh, encouraging for the Christian homemaker, and FULL of helpful tips for managing our homes (and yes, doing the laundry)! Domestically Divine is a homemaking linkup where we can equip and encourage one another in our high calling as wives, mothers, and homemakers. To share a link to your post about homemaking, you can use the Linky below. Share your link (make sure the link goes directly to your post), title, and image. It's that easy! Don’t forget to link back here so that others can join in. That was a terrific post and right along the lines of what I have been blogging about. Your graphic is so sweet. Thanks for hosting today and welcome to the niche of Christian homemaking bloggers. You will make this blog a wonderful place to visit!! I'm quite sure that laundry will one day be the death of me. But thank you so much for sharing your tips and for hosting! Hi Lexie! Hope these tips help you! I know that laundry has been my nemesis for a LONG time!!! Thanks for reading and for your comment!